THE PREMIER LEAGUE TITLE CHALLENGE: The last sprint illustrated! 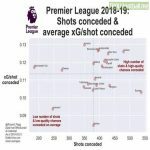 EPL teams’ shots conceded vs average xG/shot conceded, [via @Russell_Pegg on Twitter]. PSG's supporter on French TV : "It is now a pain to support the PSG"
Wife and Agent of Mauro Icardi wins the esteemed Socrates Award in Milan which promotes free speech and expression.